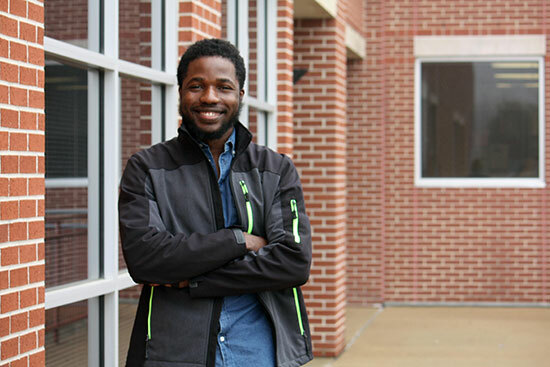 When Ugochukwu “Ugo” Mozie began taking classes at Blinn College in Fall 2015, he knew a long, challenging road to completing his education lay ahead. The 26-year-old had uprooted from his life in Nigeria to follow his uncle – then a Blinn College professor – to the United States to pursue a collegiate degree. With initial hopes of attending a four-year university immediately upon arrival, the biology major soon realized that Blinn’s affordability and intimate atmosphere made the College the perfect place to begin his education. According to the Texas Higher Education Coordinating Board’s CollegeForAllTexans.com, Blinn students who enrolled in 30 credit hours during the 2017-18 academic year saved $3,717, or 41.9 percent, compared to state residents at the average Texas public university. In addition to Blinn’s low tuition and fees, the Blinn Foundation offers more than 200 endowed scholarships available to incoming and returning students from a wide range of backgrounds, majors, and experiences. Blinn students and prospective students also can register for external scholarships and participate in grant programs. Shortly after Mozie arrived on the Blinn College-Bryan Campus, culture shock and homesickness compelled him to turn to the Blinn’s International Office for guidance and support. There, he received one-on-one advising about Blinn’s degree programs, immigration processes, and fellowship opportunities. Mozie’s eagerness to learn about his new home and to help his international peers do the same impressed her from the start, Admissions and Records Coordinator Rachel Landolt said. Mozie will attend Sam Houston State University this fall, where he will study biology. His goal is to become a medical professional in the field of pharmaceutical research. Blinn’s affordability is matched by an exceptional academic reputation that has made it a state leader in transferring students to four-year universities. Blinn has articulation agreements in place with 39 four-year institutions, and its academic transfer rate regularly ranks among the highest in the state and the nation. Though he has not seen his family since leaving Nigeria in 2015, Mozie knows he will one day accomplish the goals he came to the United States to achieve. Registration for Blinn’s May Minimester and Summer I, Summer II, and Fall semesters opens to the public on Monday, April 9. For enrollment information and to learn about financial aid opportunities, visit www.blinn.edu.